During my time w/ Ace Hotel (2013-2019) I did annual events around Fashion Week. We developed programs that highlighted the work of artists and partners putting sustainability, social justice and equality on stage alongside their looks. These were all super different, always fun and we even got some nice press along the way. DRØME emailed Ace Hotel, asking if we'd buy their 2nd issue for rooms. Their aim was described as "fostering community of doers carves out space for empathy and kindness, working against mainstream ideologies that indoctrinate patriarchal and hateful theories via policy". I wasn’t in a position to buy the magazine but liked their mission and asked them if they had plans for Fashion Week. The evening featured original looks by Homic, Elle Barbeito, Archie Robertson, Sanchez-Kane, Falcon, Helena Eisenhart, Possessed, Jahise LeBouef, Brian Swift, Official Rebrand, Noah Pica and Leila Jinnah. Music curated by Amber Valentine, Son of Lee, Blu Detiger, Coven King and Sola. It was a blowout. I am not sure another body could have fit in the building that night. Line down the street. Thanks, DRØME. The Lewis-Ashley family home, a loft in Hell’s Kitchen, is somewhat of a cultural mecca. Throughout the years intimate gatherings over great food have attracted the likes of Fela Kuti, Danny Glover, Amiri Baraka, Sonia Sanchez and August Wilson. One of the Lewis-Ashley's own, Kimani, is part of Ace Hotel's front desk team, and was asked to create his own take on the classic NYC salon. Kimani was gifted a loft suite for two nights and asked to use it was place to discuss issues of identity, gender, race, safety, etc as related to fashion, both personal and industry. Illuscious was NYC's first public exhibition of Textile Hive — a physical, digital and contextual collection of over 40,000 antique and handmade textiles spanning fifty countries and 200 years of design history. Andrea Aranow, the co-founder of Textile Hive (along with her son Caleb Sayan), has been collecting fabrics from all over the world for decades, beginning in Peru in the 1970s. Andrea invited a group of artists get inspired by the collection and create hand-painted yukatas made with Japanese washi paper. Models then walked the hotel lobby wearing these original artworks. Ace Hotel New York teamed up with artist Jae Rhim Lee and her company, Coeio, to produce a gallery exhibition, an evening of performance, and a gifting opportunity all to promote the Infinity Burial Project and the concept of green burials more generally. We added in some music by noted mushroom-hound John Cage, a collection of dried mushroom specimens from Blue Oyster Cultivation, and called the whole thing Natural Causes. Coverage from Vogue, The Creators Project, Hyperallergic and Dwell. Ace Hotel New York and Ace Hotel London Shoreditch presented Platforms Heal, supported by Squarespace. This program took shape during New York Fashion Week and London Fashion Week, respectively, using the loose lens of fashion to address topics of transphobia, xenophobia, racism and classism. DarkMatter (NYC) produced an online zine, ctrl/alt/gender, promoting gender non-conformity. In London, Selina Nwulu wrote a series of works titled Another Lens, which directly confront the exploitation of black culture and the black body. The project earned positive press from Dazed, Time Out New York, and more. 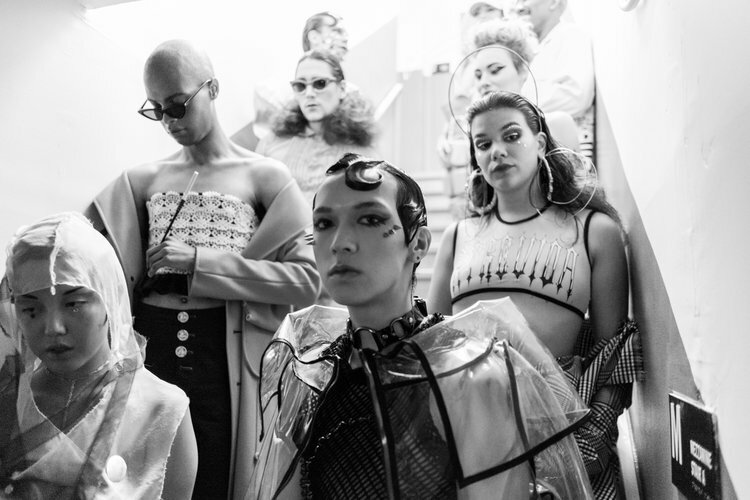 I read a short blurb on designer Gogo Graham in i-D, reached out to offer space for photoshoots, and she responded with another idea: a full-on runway show for her new SS '16 line. In Gogo's words, "Gogo Graham’s namesake ready-to-wear line is created for trans femmes. Aside from the daily, often violent demands of living as an out trans woman in the city, each girl is also constantly confronted with the dysphoria-inducing decision of which clothing options, primarily designed for cisgender women, fits her body less poorly than others. This should not be the case." The show was heralded as "groundbreaking" (Dazed), and earned positive press from Huffington Post, i-D, Posture Magazine, Bullett, W Magazine, and more. For Beyond Measure, Ace Hotel teamed up with suit-makers Bindle & Keep and lifestyle co. dapperQ to award three community-nominated do-gooders with custom bespoke suits. Hundreds of nominations came in, which were voted on by JD Samson, Murray Hill, and dapperQ. In the end Renata Hill, Zahyr Lauren, Tiq Milan came out on top. Out.com, Nylon, GLAAD, and others covered the event, leading to Ace linking up with PBS's POV for a premier screening of Out in the Night, a documentary which focuses on Renata Hill and the "NJ4". With curatorial help from post-drag collective Chez Deep, we turned some of our best rooms into a four day fashion incubator — with progressive/subversive art and design collectives from across the city re-interpreting fashion in costumes, wearables and other fact-finding ephemera. Chez Deep, Mike and Claire, Houe of Ladosha, and FCKNLZ took part, and in short this was an extension of Ace's Artists in Residence program. All weekend long people produced artifacts within the loose confines of "fashion" (flow charts, costumes, new looks, music videos, writings, candy, and more). On Sunday September 7 — during Fashion Week itself — these garments, furniture wrappings, videos, and other fruits of labor were debuted in Liberty Hall in a public party withl guest DJs D'hanna and DJ False Witness. This was really fun, but the party was a bit of a flop. I blame not having open-bar during NYFW. Cool Hunting said some nice things about it, as did Complex.